Once we begin to lose hair and the degree of balding increases with age, this ultimately motivates most of us to look for a solution. While certain shampoos or medications used to prevent the hair loss may prove effective to some extent, it is impossible to restore hair to its original state through these measures only. As it is most commonly referred to as hair simulation, we will use the term “hair simulation” hereafter. The purpose of hair simulation is to create the appearance of greater hair density by processing tiny particles of pigment on the balding or thinning scalp to resemble short hair. In other words, no extra hair is added to the scalp but only the illusion of more hair is provided. Therefore, scalp micropigmentation can prove a successful manipulation technique only if it is done by a specialist. In this technique, some sort of “hair effect” is given to the scalp. At the end of the procedure, the person seems to have tiny hairs. It gives a shaved stubble look on the head. Who Can Get Hair Simulation? Hair simulation is suitable for the persons with all types of hair loss or thinning hair or those who received hair transplant with the FUT technique (a relatively old hair transplant method) and are now uncomfortable due to the scarring it left; or those who have hair loss in the scalp, beard or mustache due to burning or injury; or those with bald patches due to scalp ringworm (tinea capitis) or people with very limited healthy hair follicles in their donor site. Besides, in the cases where hair transplant fails to yield the desired outcome due to limited hair reserve in the donor site, this method can be applied to give an appearance of greater hair density. How Long Does Hair Simulation Procedure Take? The duration of the hair simulation procedure varies, depending on the extent of the hair loss. If it will take a long time to complete, the application can sometimes be extended to several sessions on different days. For a more precise estimation of time required, we need to base our estimations on the Norwood-Hamilton Scale, which classifies the degree of hair loss. How Long Will Hair Simulation Last? Will I Need Reapplication? The effect of hair simulation lasts 3 to 7 years. Certain factors such as the immune system of the person and the scalp’s exposure to sunlight may extend or shorten the duration of effect. The ink used in the hair simulation procedure is of high quality and designed to last in the scalp for a long time. At the end of 3 years, you do not have to repeat the process from scratch; you can get the fresh appearance with one-session maintenance touch-ups done every three to seven years. How Is Hair Simulation Procedure Performed? Dermatologically tested herbal pigments that contain no heavy metals are injected into the scalp via fine microneedles. Although the microneedles specifically designed for this procedure are very important, the fineness of the needle tips is not more important than the technique and expertise of the person performing the procedure. At this point, we recommend that you research about the centers extra carefully that attempt to focus all your attention on the quality of the products and the microneedles they are using. Is There A Profession Called Hair Simulation Expert? No, there is no such profession officially recognized in our country. Such an expertise must be certified by the Ministry of Education to be official, but the Turkish Ministry of Education does not currently offer such a certification program. 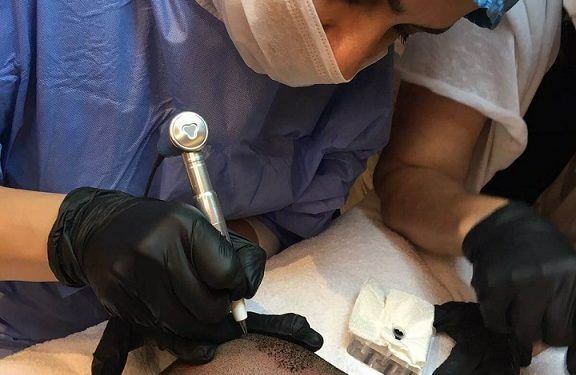 Technically speaking, the aestheticians who have received permanent make-up training from the Ministry of Education are the most qualified professionals to apply the procedure. At our clinic, the procedure is performed by certified aestheticians experienced in permanent make-up and hair simulation. All processes are performed under the supervision of the dermatologist Meltem Şentürk. Stop smoking at least 2 days before the procedure and alcohol consumption 3 days prior to the procedure. Stop using anticoagulants, or blood thinners, one week before the procedure. Discontinue the use of minoxidil-containing solutions 3 days before the procedure. Do not consume herbal teas that you are not sure of their ingredients for at least one week before the procedure. Do not expose your hair to sunlight for one week before the procedure. Inform us about the medications you regularly use. Dress casual as the procedure takes considerable time. It is very important to follow these instructions after you receive hair simulation in order to ensure maximum benefit from the procedure. Hair should not be washed for 3 days after the procedure. You should not go swimming in the sea or a pool for 10 days. You should avoid sunbathing for 10 days. You should discontinue any use of hair spray or any product for hair loss for 10 days.